Lively, engaging online content to teach English to speakers of other languages. The building block structure enables students to master the language in a step-by-step process, giving them the confidence they need to read, write, and speak English. 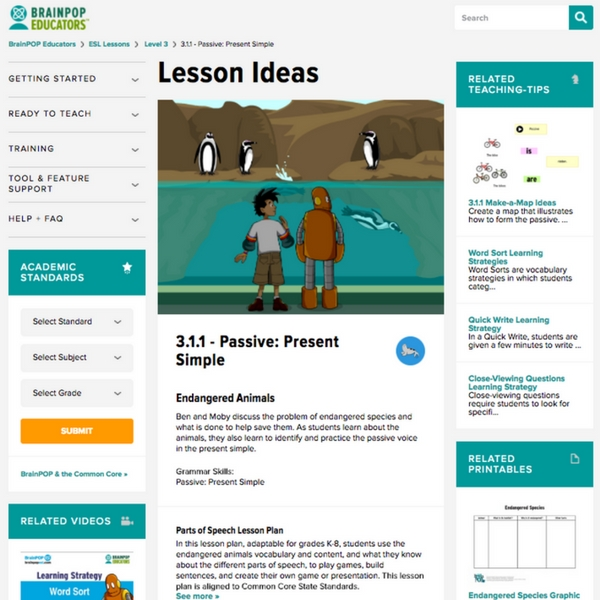 Bringing together the best of language-learning pedagogy and innovative interactive media, BrainPOP ELL continuously engages and challenges English language learners while remaining sensitive to their varying needs and learning styles. BrainPOP ELL movies are levelled, with each new movie and associated features building upon earlier ones. Resources for teachers include detailed lesson plans with printables. This approach reinforces vocabulary, grammar, pronunciation, reading comprehension, and writing skills. The topics range from simple everyday scenarios to more complex content-related stories that reflect what students are learning in the classroom. Idiomatic and cultural nuances, as expressed through the actions of the endearing and funny characters, model social cues and demonstrate how to use the English language in every day contexts. BrainPOP ELL movies are animations whose themes progress from simple, everyday experiences to content-related stories. Each BrainPOP ELL movie introduces 12-15 new vocabulary words and a grammar topic that are modeled through the conversation, animation, and storyline. 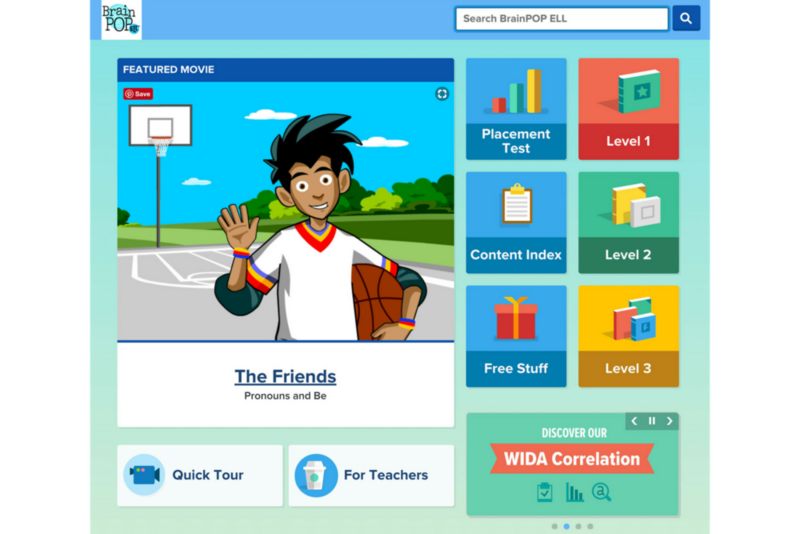 BrainPOP ELL complies with TESOL ELP levels, CEFR levels and WIDA ELD levels. 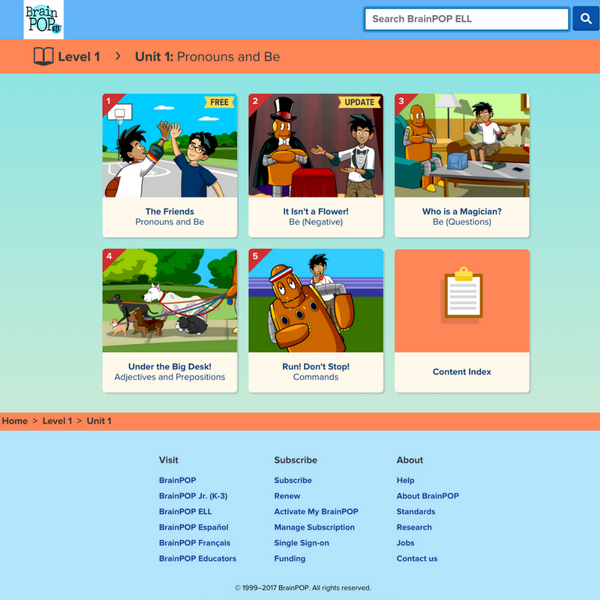 Organised in three levels, BrainPOP ELL progresses from beginner to advanced in all areas of language learning: listening, speaking, reading, and writing. The Placement Test assesses students’ receptive language skills using short and extended listening and reading tasks plus accompanying questions. The test identifies the level and unit where each student should begin the BrainPOP ELL program. BrainPOP ELL placements align with commonly recognised English language proficiency levels. Assesses students’ receptive language skills using short and extended listening and reading tasks. The length of the audio and written passages increases as levels advance. Depending on how far a student progresses, testing time varies from 15–40 minutes. BrainPOP ELL follows a grammar-based progression, from beginner to advanced levels. Each lesson focuses on a grammar topic presented in engaging, animated movies about relatable social situations and academic content. Take a look at the grammar index for yourself. A pathway to ELL success! Students apply their understanding of featured grammar, vocabulary, and content in fun, interactive games and quizzes, reinforcing and deepening learning. BrainPOP ELL’s reading and writing curriculum begins with simple sentence construction in Level 1. Levels 2 and 3 continue with simple paragraphs and advance to reading and writing multiple-paragraph essays highlighting different text structures, including narrative, persuasive, and informational. Reading passages serve as models for student writing and also assess understanding with questions using context clues, textual evidence, and higher level thinking. Linear; grammar based topics build on each other. Even if you're following a content-based curriculum, with no explicit grammar teaching, this gives students a way to incorporate the grammar they still need. Great for newcomers who arrive throughout the year! Follow our program or use as a supplement. Placement Test tests receptive knowledge (listening and reading comprehension). Begins with non-speakers/readers and progresses to advanced level of LSRW (listening, speaking, reading, writing). 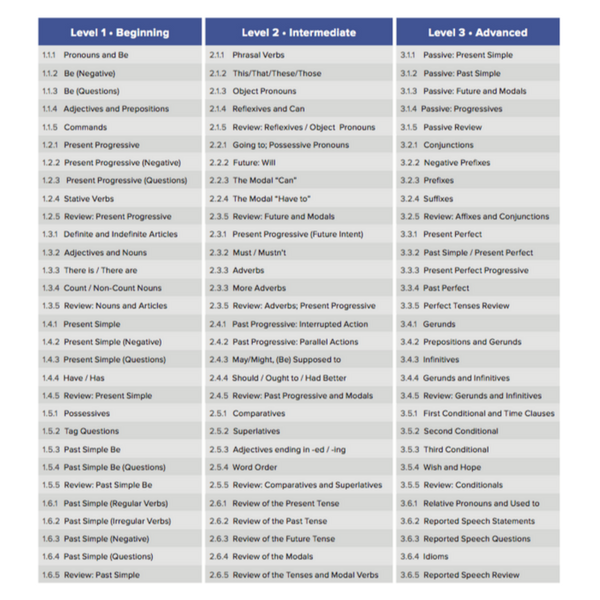 3 levels – Beginning, Intermediate, Advanced. Levels correspond to Tesol and WIDA language proficiency levels. 30 lesson per level; 90 lessons total. 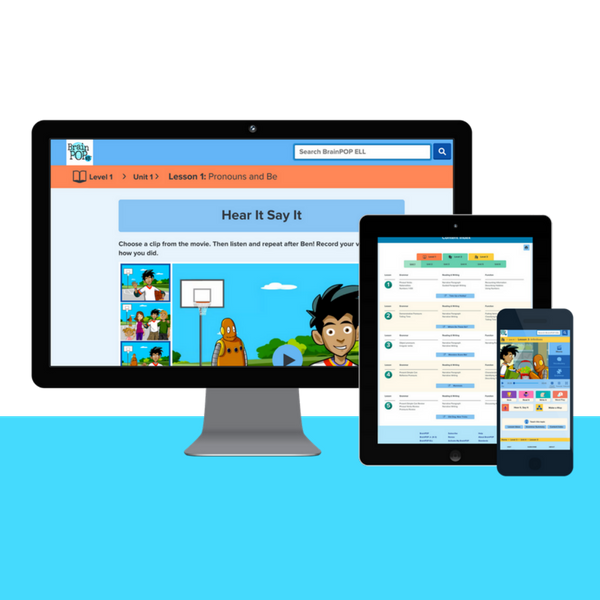 Ready to try BrainPOP ELL at your school?